Travellers who want to visit the infamous Thai bridge built by thousands of British Prisoners Of War (POW's) during the second world war. What are the options? We recently noticed that a huge amount of adverts offering scheduled flights to Thailand for the UK winter holiday market are being offered by most international carriers. The following suggestion is for those who choose to fly direct to Bangkok rather than other Thai beach resort airports. 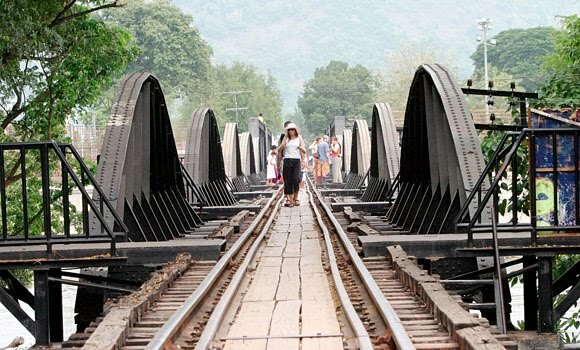 Image - Tourists cross the Bridge over the River Kwai, part of the infamous Death Railway, in Kanchanaburi, Thailand. I am stopping off in Bangkok on my way back from New Zealand, and I would like to spend a few days visiting the bridge on the River Kwai, and other sites where my father might have worked as a Japanese PoW during the second world war. Are there any organised tours from Bangkok? The small town of Kanchanaburi is about 80 miles west of Bangkok and attracts many visitors, most of whom are coming to see the bridge over the River Kwai and other sites connected with the infamous Death Railway. The museums and memorials, and especially the Commonwealth War Graves Commission cemetery (www.cwgc.org), are profoundly moving, even without a strong personal connection. Trailfinders has a day trip from Bangkok from £35pp.You will be taken by minibus or coach to Kanchanaburi to visit the Thailand-Burma Railway Centre. Then there is a boat ride to the bridge over the River Kwai and, after lunch, a train journey with scenic views along the river, before the drive back to Bangkok. Hellfire Tours also runs trips from Bangkok, with a very military-history focus.